The Buenos Aires Punta del Este ferry route connects Argentina with Uruguay. 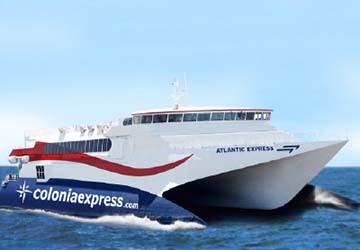 Currently there is just the 1 ferry company operating this ferry service, Colonia Express. The crossing operates up to 8 times each week with sailing durations from around 6 hours. Buenos Aires Punta del Este sailing durations and frequency may vary from season to season so we’d advise doing a live check to get the most up to date information. Argentina’s capital Buenos Aires is located on the western shores of the mammoth River Plate estuary. There are daily sailings from the country’s largest city to the Uruguayan cities of Montevideo and Colonia del Sacramento. Both Buquebus and Colonia Express operate on these routes. Things to do in Buenos Aires? It’s a multicultural metropolis that has retained much of its historical European identity, evident in the downtown clash of architecture that ranges from the soaring towers of the central business district to the pink walls of the Italianate-style Casa Rosada presidential palace. Whether you want to try your hand at tango dancing, want to sample the delicious local cuisine, want to go market hopping or fancy a stroll through the spectacular Cementerio de la Recoleta, the city is bursting with culture, tradition and there really is something for everyone to enjoy. What transport is on offer? Just a few minutes’ walk from outside the port entrance is the Marina Nueva train station that offers routes deeper into the suburbs of Buenos Aires, including a stop by the city’s international airport on the coast. The extensive National Route 9 highway, just a few minutes’ drive from the port, cuts north and connects motorists to other major Argentinian cities including Rosario and Cordoba. What about the ferry services? Passenger routes run from the port multiple times throughout the week, serviced by Buquebus and Colonia Express ferries. Both these lines offer daily routes to the nearby capital of Montevideo in Uruguay, a short distant across the River Plate, and the smaller Uruguayan city of Colonia Del Sacramento. The sailing time to Colonia del Sacramento is one hour and fifteen minutes, while the Montevideo route varies from between two hours fifteen to four hours fifty.